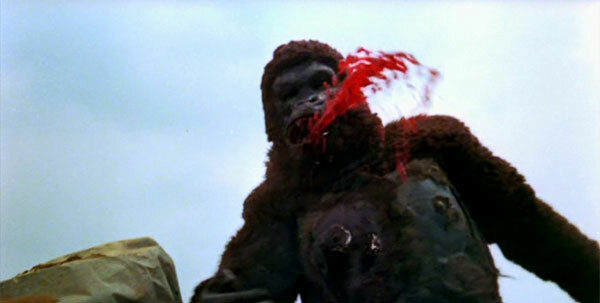 A 36-foot tall ape escapes future enslavement at Disneyland and decides to take out his frustrations on South Korea. Along the way, he takes a fancy to a movie star, Marilyn Baker (Joanna Kerns). After the ape hunts her down and runs off, Tom (Rod Arrants), Colonel Davis (Alex Nicol) and Captain Kim (Nak-hun Lee) give pursuit. Will the ape find true love or just a lot of bullets? 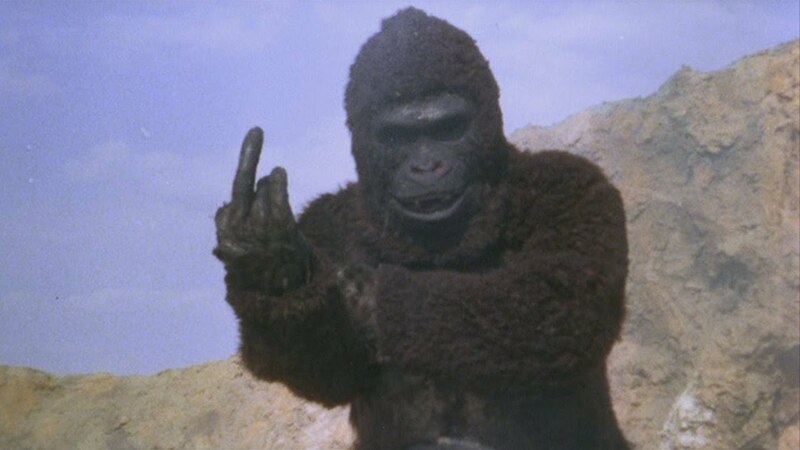 APE was made to cash-in on the release of Dino Dilaurentiis' King Kong (1976) remake and managed to beat it into the theaters by two months. APE throws everything it can into the mix to try and attract an audience. Do you like giant apes? We have you covered. Did you think Jaws (1975) was great? Well, our ape fights a giant shark. Do you like the television show M*A*S*H? Hey, we’re going to title our movie, A*P*E. Toss in some 3-D and you have a film that leaves no then-popular trend untouched. It is a pity that the script and the effects budget didn’t get nearly as much attention, but you have to make sacrifices somewhere, I suppose. APE lets the audience know exactly what it thinks of them. The flow of APE’s narrative feels like someone wrote the script after only hearing descriptions of what happens in giant ape movies. The ape is captured conveniently off-screen and is being shipped by boat to America. The story calls for the ape to get loose so it can rampage around South Korea. So, the movie just has the boat explode and the monster gets out. No explanation. 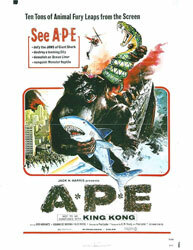 Shortly after the ape gets in a fight with a giant shark, or more accurately a guy in a sopping wet ape suit punches a dead shark in someone’s pool for what seems like an hour, we get our movie star in distress, the American and Korean military struggling to deal with the monster, we have the traditional hordes of people running away and so on. All the key elements for a kaiju movie are here they are just incompetently executed. Just how incompetent? The ape doesn’t stomp on buildings so much as trip over them. When it comes time to fight a giant snake, someone just hands him a real snake like it’s a threat. Marilyn veers from screaming her head off about being grabbed to cooing and saying sweet things to the monster and then back again. The 3D scenes consist of people jabbing things directly into the camera over and over. It’s all a colossal mess, but it is an amazing colossal mess. This Fruit Gushers™ ad did not go over well. The acting is all around terrible, but the secret MVP of the entire of the movie is Alex Nicol as Colonel Davis, a man who's only defining feature is that he finds giant ape invasions endlessly irritating. Davis grouses at everyone, barks orders, and ignores phone calls to smoke cigarettes. He is a treasure.